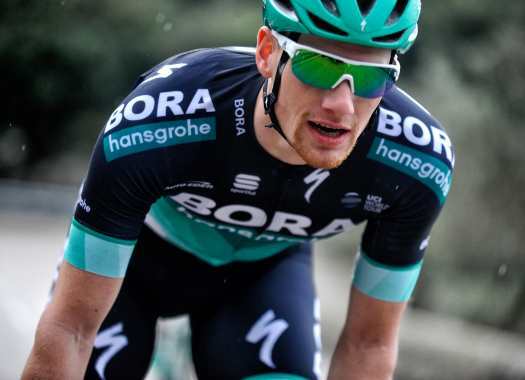 Bora-hansgrohe's Sam Bennett has taken the victory of the first stage of the Tour of Turkey. The Irishman outsprinted Fabio Jakobsen and Caleb Ewan. The first stage of the Turkish race was 156.7 kilometres long between Istanbul and Tekirdag over a route that suited the fast men. The escape of the day was formed by five riders and included names like Alvaro Robredo, Lorenzo Fortunato and Emerson Oronte, among others. The front group took a lead of more than five minutes over a pack that was pulled by Lotto Soudal, Bora-hansgrohe and Deceuninck-Quick-Step. The last of the escapees were caught with 22 kilometres to go. Deceuninck-Quick-Step formed a perfect lead-out train for Fabio Jakobsen and Bora-hansgrohe's Sam Bennett managed to stay at his wheel, overtaking him at the last moment and taking his eighth victory in the race. Lotto Soudal's Caleb Ewan, Delko Marseille Provence's Eduard Michael Grosu and UAE Team Emirates' Simone Consonni completed the top-five of the day. Bennett also took the lead of the General Classification of the race.